A turn-key solution proven to reduce workplace injuries. Everything a business needs to prevent workplace injuries. Train and inspire employees in healthy living. Optimizing the work-space for safety and productivity. Programs to improve health and wellness organizationally. Improve employee's ability to become and remain healthy improving their productivity and reducing your absenteeism and injury costs. What is a WorkSiteRight healthcare program? WorkSiteRight offers proven onsite healthcare programs that include ergonomic intervention, injury prevention, consultation with your management, and employee education. WorkSiteRight uses chiropractors to provide healthcare and perform a regular WorkSiteWalk©. Musculoskeletal conditions and poor health habits driving cost, chiropractic is a safe, affordable, drug-free solution that emphasizes prevention and early treatment. We vet chiropractors to find the right provider for your workplace. We train the chiropractor on best practices. We communicate with management on recommendations for the workplace. We communicate with the chiropractor with company goals and site feedback. We contribute educational materials to your wellness initiatives. Our proven programs increase productivity and profitability operating on a price-predictive model. Customized, scaled programs provide services that can substantially improve the health, well-being and safety of your employees. Our programs respect your budget, your business and your time providing a significant ROI. By focusing on prevention and early treatment, we’re frequently able to address health issues before costly prescription drugs are needed. A sound onsite healthcare program should keep workers operating at peak efficiency. Prevention and early intervention address conditions at the onset, before they're a huge problem, and helps the workforce stay productive. We've found this significantly reduces the costs of healthcare services for employers. Convenient access to the onsite chiropractor can many times filter out unnecessary visits to the emergency room or urgent care. offering onsite care increase their ability to attract and retain top talent. Increased morale and employee engagement motivates employees to perform at their best. In addition, innovative benefits attract top talent. "Organizations with high employee engagement outperform those with low employee engagement by 202%." Here are the top reasons you should initiate an onsite health and wellness program at your facility. Providing healthcare to employees is expensive. 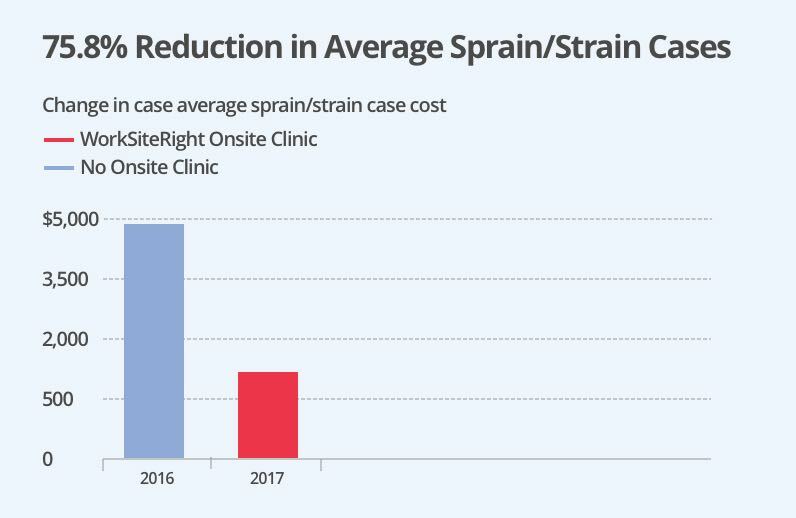 An onsite clinic can bring those costs down by limiting hospital stays and visits to specialists and emergency rooms. The convenience of onsite care increases employee engagement. That means issues are caught and treated early, before they become serious. Providing onsite health and wellness services sends a message to both employees and recruits that you care about their well-being. Onsite care is a key component to a culture of well-being and can support other wellness programs. It influences employee attitudes and improves engagement. The convenience of onsite care often results in early detection which keeps people working. The average onsite visit is 10 to 20 minutes, much less than the time required for offsite appointments. Ready to see what WorkSiteRight can do for your business? WorkSiteRight is a division of the H.C. Sweere Center for Clinical Biomechanics and Applied Ergonomics, located on the campus of Northwestern Health Sciences University. Northwestern Health Sciences University is a non-profit organization.